I am a recording engineer and musician who has ended up taking photos, making videos and other stuff. Welcome to our new 'Visuals' series, where we will endeavour to showcase visual artists whose work enriches the music industry, but so often doesn't get the credit and love it deserves. I'm currently based in Dublin. I also lived and ran a studio in Liverpool for many years and had short stints in London and New York. My main buzz is in the recording and production of music, but more and more I'm doing still imagery and video. I like capturing moments, whether its on a record, in an image or through a video. I like producing stuff thats fairly dark, over-processed and quite intense. I use a combination of new and old techniques and gear, which makes stuff look or sound kinda lo-fi and fucked up. What drew you to music photography? Music production has always been the focal point for me, but I think the documentation or visual component connects the audience with the people behind the music and acts as a tease into the process, their thoughts or the overall attitude behind its creation. An image of an artist's expression adds another layer of personality, and gives an insight into the moment. Its like putting a face to a name, and its a powerful addition to the overall perception of an album or piece of art. Music photography wasn't really an early priority compared to the music-making itself. My first real music photo shoot was with Solar Bears. I think that this picture from that shoot (pictured above) has really set the tone for every music related picture I have taken since. Photography itself was always an interest, but it was something I had never really dug into. While I had cameras over the years, I had never really felt I had something worth shooting. I started documenting recording sessions and shooting live studio vids while in Liverpool, but the outer cultural landscape of Ireland and England seemed all too familiar to warrant shooting. It was only when I moved to New York that I realised I needed to get a camera and document my discovery and exploration of the city. I think I needed to go somewhere different enough to justify learning a new practice. I have recently created a hyper-lapse of my time in New York. Its every picture taken in my time there with sounds provided by Rían Trench who is a friend and music production partner (under the Deaf Brothers moniker) the past few years. Tell us about your photo series of doors in NYC? 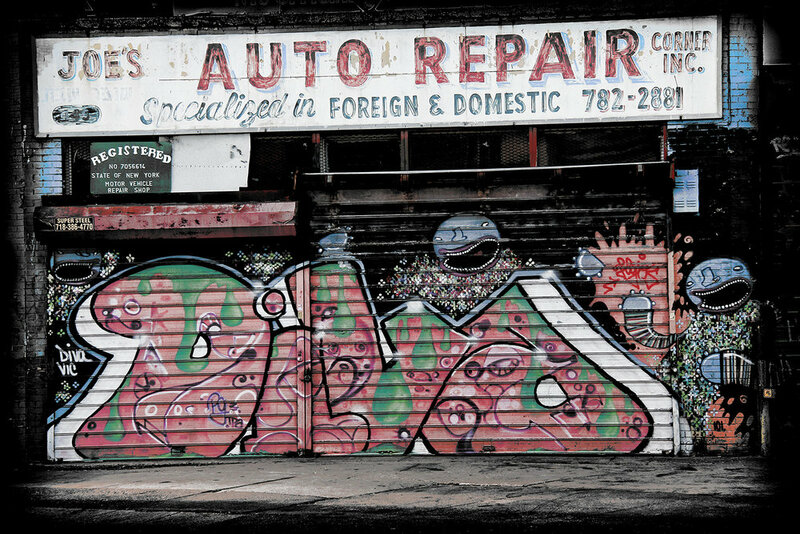 While I was there I began shooting these graffiti bombed doors. I was taken with the conversations and interactions these seemingly insignificant doors presented. There were these reoccurring characters, calls and responses and it was a real reflection on where you were in the city and a reflection on the attitude and aspirations of the quickly gentrifying neighbourhoods throughout the five boroughs. When I got back to Ireland I collated and edited the best of these shots into a little collection which has had three exhibitions to date in Dublin, Liverpool and Sydney. I have also been working on other cities over the years so more street stuff will appear in time. I don't feel right going somewhere now without having some creative output in mind. As you've said, you're spending a lot of time documenting the process with musicians in Dublin. Who have you had the pleasure of shadowing lately? I have worked with some of the best techs, bands and artists in Ireland and can gladly say that I get to work, record and shoot with my friends. Good people, in good places with good kit. That's the buzz. Most recently I was lucky enough to cover New Secret Weapon recording in Chicago with Steve Albini at Electrical Audio, shooting Salty Dog Stage at the Picnic and see the release of the Alarmist album Rían and myself had the pleasure to work on last year. I put together a vid for "Petrichor", the lead track from the album, Popular Demain, which was just released on Small Pond Recordings. I've become very interested in these 'Hyper-lapse' things the past year or so. There like little flick-books that breathe life into the stills again. I have now started shooting with this in mind. I shoot movements and surroundings and while the focus is still on getting good images I also now think about capturing the vibe of the place and peoples' interaction within the space. The first one of these to be released was for Girl Band. I was lucky to hang out at the sessions a bit and shoot some pics for the lads. The teaser is assembled out of all the shots taken and was used as the first sneaky peak in to their debut album for Rough Trade Records, "Holding Hands With Jamie". When I started recording again in Ireland with Rían, I had the opportunity to bring the camera into the process at a more integral level. The first production we did was really just to see what it was like to work together in the studio. The concept was simple - to see what three people (Trenchurian, Molotov Ape and myself) could produce in a 24 hour period and to shoot the process. This project was a combination of old and new ideas about recording, how I wanted to cover the method and how present that in a particular style or direction. The first big Deaf Brothers production was No Spill Blood's first album, "Heavy Electricity", for Sargeant House. Lar, Matt and Ruadhan were quickly accepting of the camera and I shot the entire seven day lock-in at The Meadow in Wicklow while "Heavy Electricity" was put together. Heavy Electricity gave us a chance to make a record with some of our favourite musicians, and for me it was an opportunity to have something expansive to cover. Since the No Spill sessions there has been loads of stuff going on and I have been lucky to have shot many great people, places, recording sessions, gigs and festivals. Any advice for someone who is picking up a camera for the first time? I think the key is what you shoot rather than how you shoot it. The more you work on the method, the more you will realise what is good and what works for you, and that becomes your style. While kit and processes are important factors in any good production, what's more important is the content itself and being able to have an eye or ear on whats happening and trying to capture the moment. RT @jetfury: I know I’m incredibly lucky to do what I do, but sometimes I wake up and absolutely Fuking hate music.